My blog is worth $84,681.00. Family just went to mall for some additional shopping for hubby’s gifts to his technical personnel. He used to manage the Engineering Department of a radio network and annually he gives them something of use at home or in the office. It is not hard to find gift like that so we went straight on SM Marikina’s Department Store. Fortunately, unlike in other SM branches and malls the SM in Marikina was not congested with shoppers and even in the cashier you won’t find a hard time paying for your items. Another thing hubby and I scouted for was the cellphone we will give to our daughter as a Christmas gift. Kids nowadays are far different. They are fond of gadgets, accessories and things they see around them. She keeps on requesting for a cellphone as a Christmas gift but we are in doubt if we will grant it. After weighing things, we opted to buy one for her. 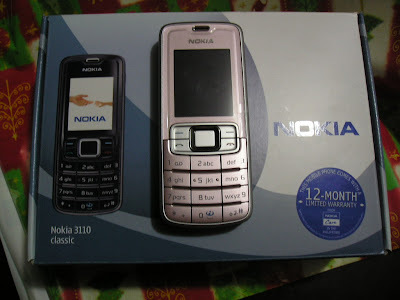 We chose the pink NOKIA 3110 Classic for her. I am pretty sure she will like it coz aside from the color it has a camera and FM station. Just keep my fingers cross on her promise that she will study harder. Sometimes parents do give in on the request of their kids for them not to feel they are left behind by others. Its just that for parents, we need to weigh things first and if it is a yes or a no what is important is that we explain to them why or why not. What do you think??? Housewife @ Work is back!!! Shopping for shoes this Christmas?